Struggling chipmaker AMD hosted an all-day meeting in New York City on Wednesday to reassure financial analysts that its product portfolio is strong and it plans to return to growth this year. During the meeting – AMD's first in three years – CEO Lisa Su said she plans to return the company to profitability in the second half of 2015. And while the succeeding quarters could still be rocky, she said, she envisions reaching sustainable profitability by 2016. 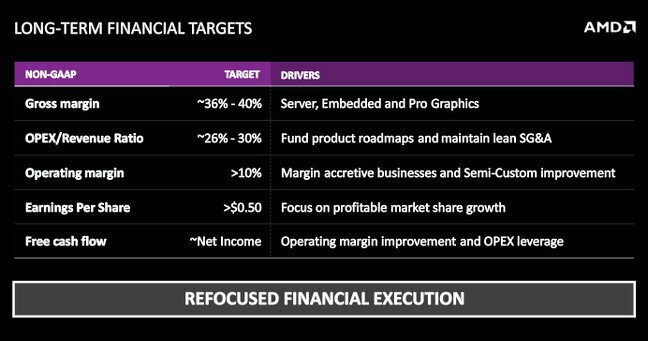 Part of that plan involves redoubling AMD's efforts in the PC market. Su said the firm is reinvesting in high-end desktop FX CPUs, a significant strategy shift from recent years. 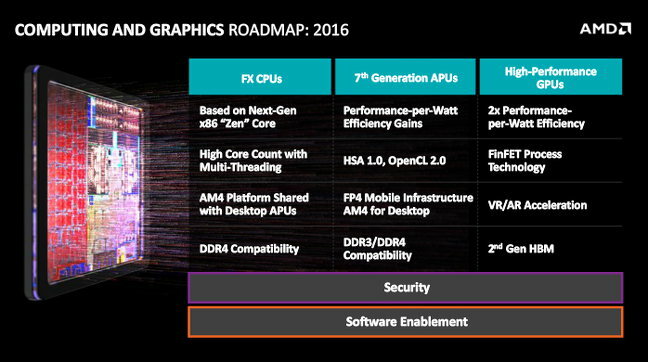 These FX chips will pack AMD's Zen x86 cores, due to arrive in 2016: there are no technical details available on the Zen design just yet, other than claims it can execute 40 per cent more instructions per processor clock tick than the forthcoming Excavator cores. Zen cores will be built from 3D FinFET gates, run two threads at the same time using simultaneous multithreading techniques, and feature a new "high-bandwidth, low-latency cache system." AMD is also planning to ramp up its efforts in the workstation GPU market, an area where its graphics business traditionally hasn't been that strong. Su said that in addition to scoring an important win by powering the graphics in the Apple Mac Pro, AMD is also partnering on workstations with HP and Dell. But it's also planning to invest aggressively in alternative markets, including gaming, embedded systems, and graphics for high-resolution, high-bandwidth virtual reality systems, which Su described as "a new category" and "the toughest problem in graphics." Nor does AMD intend to ignore the data center, although Su acknowledged that it will take a while to rebuild that business. The chipmaker currently expects to see meaningful gains in the server and infrastructure markets in the 2017-2018 timeframe, driven by a strategy of providing a diverse portfolio of targeted data center products. 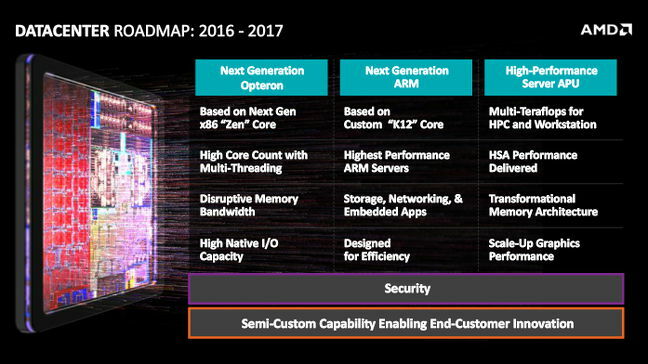 "The new workloads, the new applications, the new scale of deployments mean it's never been more important to have different points of optimization and different types of systems," Forrest Norrod, senior veep and GM of AMD's Enterprise, Embedded, and Semi-Custom Business Group said in a presentation on Wednesday. AMD is still pinning some of those hopes on servers based on the ARM processor architecture, which Norrod said AMD is uniquely positioned to deliver in a way that suits the needs of business customers. "We're the only guys in the ARM server business that have experience delivering and supporting enterprise-class CPUs," Norrod said. 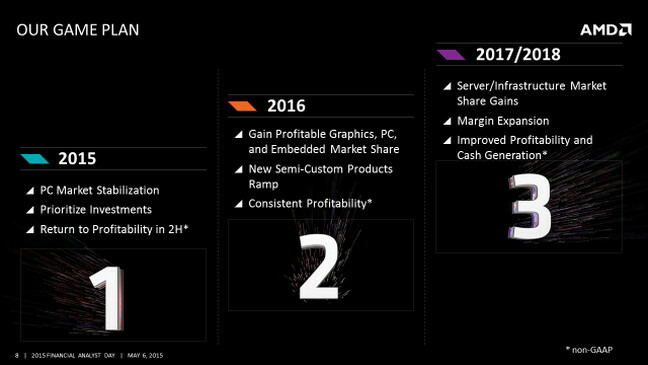 During the meeting, AMD CTO Mark Papermaster stressed that he believes AMD has a strong product lineup in 2015 and that it plans to spend in order to diversify even further while growing the company's operating margins. "We like our path," he said. "We have invested. We will deliver." 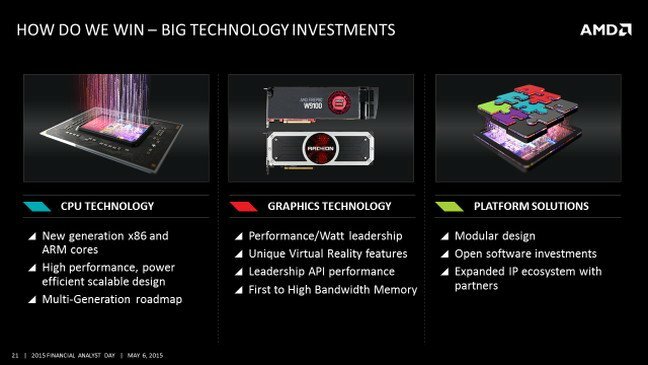 And lest any analysts in the audience remain skeptical, CFO Devinder Kumar said that although AMD's Computing and Graphics division currently loses money – to the tune of $75m in its most recent quarter – the firm not only plans to turn that around but it expects to see operating margins in the double digits in such areas as servers, embedded systems, workstation graphics, and semi-custom chips. "Our focus is on profitable growth," Kumar said. "We're not interested in chasing revenue share or unit shares in areas where it doesn't make sense." In a Q&A session following the presentations, Su said that you won't see AMD in the smartphone, tablet, or microcontroller markets, for example. It also plans to reduce its reliance on low-end PCs and laptops, which have proven to be the most volatile segment of the computing market.